It’s Race Day At Gateway Motorsports Park! Good afternoon from a sunny Gateway Motorsports Park just across the Mighty Mississippi River from St. Louis. So far, this has been a mostly positive experience. I had heard horror stories about the location of the track that led me to believe that I would be dodging bullets and at the very least be a victim to a car-jacking. While no one would mistake the surrounding area for Beverly Hills, I would describe it as a mostly commercial/industrial area. As soon as we left the track last night, we were immediately on the interstate and minutes from our hotel in Fairview Heights, IL. To be eight hours from the drop of the green flag, there is a good crowd here. Then again, I was impressed with the crowd that hung around for the practice last night that ended at 10:05. Speaking of the late night practice, it was pretty wild but incident-free. If tonight’s Bommarito Automotive Group 500 is as racy as what we saw last night – we should be in for an entertaining race. This is the first night race I have attended since the season-finale at Fontana in 2013. I had forgotten just how good these cars look under the lights. The glossy finishes of the cars just “pop” under the lights – that is except for that hideous matte-black finish of Charlie Kimball’s car. 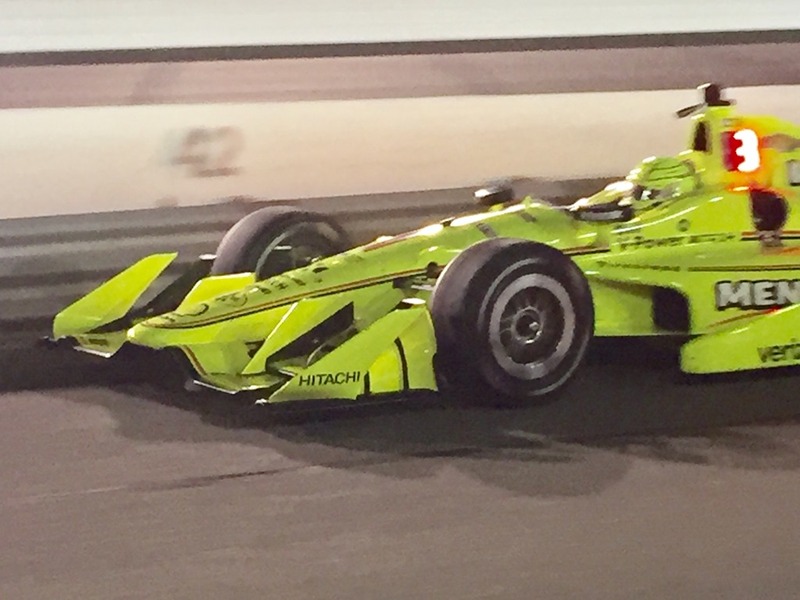 But the day-glo finish of Simon Pagenaud’s car looks spectacular. This is also the first time I’ve seen the LED panels at night. It’s amazing how much more brightly they shine in person as compared to the way they appear on television. I was not a fan of the LED’s when they were introduced, simply because I follow the credo that change is bad. But I will freely admit that they help the fans in the stands have a better idea of where the cars are in the race standings. As for the practice itself, Josef Newgarden led the way with a quick lap of 184.079 mph. Ed Carpenter was second along with Team Penske drivers Will Power and Helio Castroneves. Then there were the three Hondas of Alexander Rossi, Scott Dixon and Takuma Sato respectively. In the eighth spot was JR Hildebrand in a Chevy, followed by the Honda of Tony Kanaan in ninth and the Chevy of Conor Daly rounded out the Top-Ten in last night’s practice. What would be considered a bad weekend for Team Penske is actually a respectable weekend for the Foyt team. They have had one or two cars hovering around the Top-Ten in every session here at Gateway this weekend. This has been a rough year for Larry and AJ Foyt. I’m hooping they can have some good results tonight. Susan will have a mid-day post here regarding the fan experience at Gateway Motorsports Park as she sees it through her eyes. It will be a full day at the track this afternoon. There is Pro Mazda and Indy Lights qualifying shortly, and then the Verizon IndyCar Series autograph session at 3:30. The Pro Mazda race is at 4:55 and the Indy Lights race is at 6:00.Of course, the main event – The Bommarito Automotive Group 500 will drop the green-flag at 8:40, so it will be completely dark at the start of the race. It will be a 248-lap event, so I’m guessing it will not be over until around 11:00 local time. I’ll have a brief race recap after the race tonight, then I’ll have my usual “Random Thoughts” article on Monday. But throughout the day, you can follow me on Twitter at @Oilpressureblog or Susan at @MrsOilpressure for photos, videos and comments. Be sure and check back for Susan’s article here later this afternoon. This entry was posted on August 26, 2017 at 12:05 pm and is filed under IndyCar. You can follow any responses to this entry through the RSS 2.0 feed. You can leave a response, or trackback from your own site. Agreed on the LED panels. When announced, I was very skeptical they would be useful at all, I thought that they would be distracting. I was wrong. They proved very effective under the lights at Texas, even at 200+ MPH.